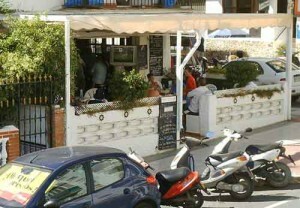 There is no shortage of Bars or Restaurants in Nerja, with over 300 to choose from, including many types and flavours. This Guide is basically divided into three main sections: Tapas Bars - Other Bars - Restaurants, and based upon the main function of the establishment. They do often overlap, of course, with bars serving food and restaurants providing a bar service. We encourage you to leave your reviews/recommendations and share your experience with others. Nerja may be a relatively small town but it certainly has a lot of bars. There are bars and cafeterias of every size and shape, nationality and with varying facilities. Traditional Spanish tapas bars tucked away in back streets, bars with 'live' entertainment, sports bars where you can watch all the major sporting events... Whatever you're looking for, you'll almost certainly find it somewhere in town. Looking for the late night music bars? 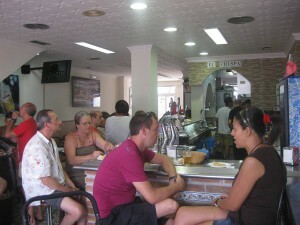 You'll find a host of them in Plaza Tutti Frutti, the main centre of nightlife in Nerja. One way of sampling a variety of tapas, enjoy the social occasion and generally have fun, is to go on a 'Tapas Run' or 'Tapas Trail'. This is really nothing more than linking a few bars together in a logical manner and route, either in a particular area or perhaps even by food style. It is easy to make up your own 'runs' or 'trails', once you get to know what is available, of course, but here are a few to get you started. Run One is a nice easy introduction, not much walking involved so you can spend more time eating and drinking, and takes in Los Bilbainos, Los Cuñaos, La Puntilla and Chispa's. Run Two adds a couple of extra bars in the same area as Run One, these being Los Cangrejos and Rincón del Sabor, but still remains a circular trail. Run Three takes you to the western end of Nerja and this trail involves sampling the delicacies in La Marina, SolyMar, Los Pescaitos, Sevillanos, Vinoleto and La Bodeguilla. Run Four is a circular route in the very centre of Nerja and takes you to Hostal Regina, La Piqueta, the Round Bar, El Pulguilla and La Taberna. There is certainly no shortage of ‘eateries’ – of every conceivable type – in Nerja so you should have no problem finding somewhere suitable. The Spanish are very family oriented and so the vast majority of restaurants are what you would describe as ‘children friendly’ and many offer a special 'children's menu'. The Spanish tend to eat lunch between 1:00 and 3:00pm and dinner between 6:00 and 10:00pm, even later during the hot summer months. There are numerous bars and restaurants offering Full English Breakfast – including some Spanish bars now – and you should expect to pay between €4 and €7 per person. Or you can have breakfast Spanish style. A coffee and a media Catalana, for example, (toasted bread roll with either butter (mantequilla) or olive oil (aceite), tomato and a decent helping of serrano ham) will set you back roughly €2 – €3. And it’s delicious. Very popular is toasted bread roll covered with olive oil and a sprinkling of salt. The choices are endless, really, and you can select whatever you want and it’s not expensive. A coffee on its own (best in a glass or vaso) is normally €0.90 for a small one (pequeño) or €1 or €1.20 for a large one (grande or doble ). Traditional snacks served with drinks and included in the price of the drink in most Spanish bars. Expect to pay between €1.20 and €1.80 for your beer/wine and tapa. 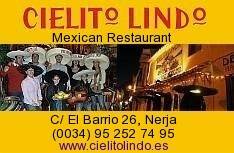 Most restaurant menus tend to be in several languages or, in many cases, with pictures of the various dishes. The ‘house’ wine (vino de la casa) is generally good quality plonk. 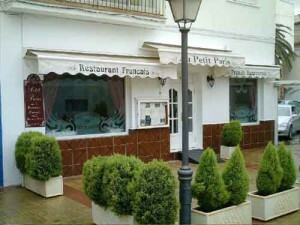 A large number of restaurants offer a Menu del Dia (Daily Menu) and this usually consists of three courses plus a drink. For each course there are normally a number of choices, so it's basically a sort of 'pick and mix' meal. Although the portions may be slightly smaller than if you were to choose each course separately from the main menu, they are still more than ample and are very good value for money. Expect to pay anywhere between €6 and €10 for a menu del dia these days. Tipping (propina) is not mandatory, generally customary or even expected in most bars and small restaurants in Spain. As a general rule, the Spanish will sometimes leave as a tip the small change left on their plate after paying a bill. I love eating out in Nerja. Plenty of choice and its great to have a walk round afterwards. favourite place at the moment is Bakus at the end of Calle Carabeo. I couldn’t agree more. Bakus has been a favourite of mine for the last couple of years now. In fact I celebrated my 50th birthday there last year over a very fancy meal and a wonderful cake made by the chef. That said, I also highly rate Oliva. I would even go so far as to say the level of cuisine is of a higher standard but Bakus is a better overall restaurant experience.